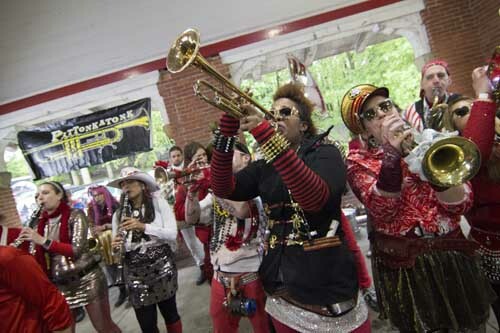 The celebration of culture manifests in different ways, and on May 11 two Pittsburgh events will share the day to showcase local and international cultures through music and food: Pittonkatonk Mayday Brass BBQ & Potluck and the Millvale Music Festival. While each has its own distinctive experience, these two events were created to be a platform for people to come together, highlight, and honor their communities. Officially dubbed Pittonkatonk in 2014, the festival was started to answer the call of HONK! in Cambridge, Mass. That three-day festival brings together brass bands from all over the country to celebrate community, music, and activism. Not only did it inspire Pete Spynda to start a Pittsburgh HONK! festival (Pittsburgh+HONK=Pittonkatonk), but there are also HONK! festivals in Seattle, Detroit, Austin, and over seas in Australia and Brazil. 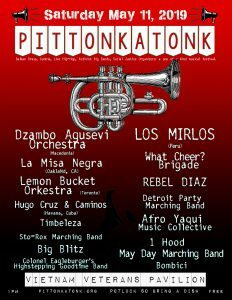 Unofficially, Pittonkatonk began as a party with What Cheer Brigade in a garage in Highland Park with around 100 people. As attendance rose each year and the event grew in popularity, the decision was made to move to the Vietnam Veteran’s Pavilion in Schenley Park. Last year there were over 5,000 people in attendance. “I think Pittonkatonk really conveys true community spirit,” Spynda said. For the potluck, hundreds of people bring a dish to share. The recipes usually tell an origin story of their own as participants are bringing their famous potato salad or their grandmother’s pierogi recipe, which in turn has “people from different backgrounds breaking bread together and listening to music from all over the world,” Spynda said. This year out of the 16 ensembles, four are international and coming into Pittsburgh from Peru, Macedonia, Canada, and Cuba. Spynda said he is able to help pay for artists’ flights through grants, which is one of the elements New Sun Rising has been able to assist with since connecting with Pittonkatonk in 2014. “They’ve really helped me and Pittonkatonk as an organization evolve in the sense of establishing a concrete foundation for what we are doing,” Spynda said. The resource tent is one initiative that Pittonkatonk and NSR are collaborating on this year to represent and share information on over a dozen social justice organizations. And new to the event is the Artivist Greenhouse where Pittonkatonk will commission three Pittsburgh artists to write new songs in collaboration with social justice organizers. This project was created to encourage artists to form deep working relationships with environmental and social justice organizations that work to clean our air and water, support immigrants, and prevent displacement. On May 10, the night before Pittonkatonk, there is a Youth Showcase at Salem’s Event Center from 6-8 p.m. presented by Remake Learning and the Grable Foundation. Ben Barson, member of Afro Yaqui Music Collective, has participated in Pittonkatonk for several years and works closely with the teens in the organizations education program to prepare for the performances. The teens participate with the performers during Pittonkatonk, but this is the first time there is an event specifically for youth involved in the event. “It’s a beautiful opportunity for them to learn how to improvise, take risks, and perform in front out thousands of people,” Barson said. Spynda said that for the past several years, City Council has declared the date the festival is held on as “Pittonkatonk Day,” but he hopes in the future the event could be presented by the City of Pittsburgh as well. 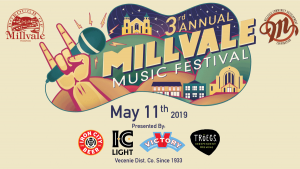 It’s around this time, after the band submissions have closed for Millvale Music Festival, that mayhem ensues, said Co-Founder Paul Bossung, Jr.
“We’ll book over 200 acts for this year, but over 460 have applied,” Bossung said. The festival, now entering its third year, will have 22 stages set up throughout Millvale and 15 different businesses and organizations are involved with the event in some way. The borough’s population almost doubles in size during the festival, which is a great opportunity for Millvale to show the opportunities is has to offer for potential future residents or small businesses. Last year, the festival brought over 5,000 visitors through Millvale. In 2018, Bossung said Sedgwick Street was strewn with artists who were performing live to accompany the bands playing. He hopes to continue that setup this year, and although he wasn’t able to confirm the details yet, Bossung hinted at the potential for a larger and reoccurring community art project. The festival has also made some technological strides this year and will have televisions in each venue so event attendees can get live updates on the bands and shuttle schedules. Bossung said what he believes makes this event unique is the amount of live performances happening within a five to ten minute walk, and also the places around Millvale where bands will be performing including the Millvale Food + Energy Hub at the former Moose lodge. “Visitors get the chance to wander around town all day and to see all of the places that are unique and special to Millvale,” Bossung said.